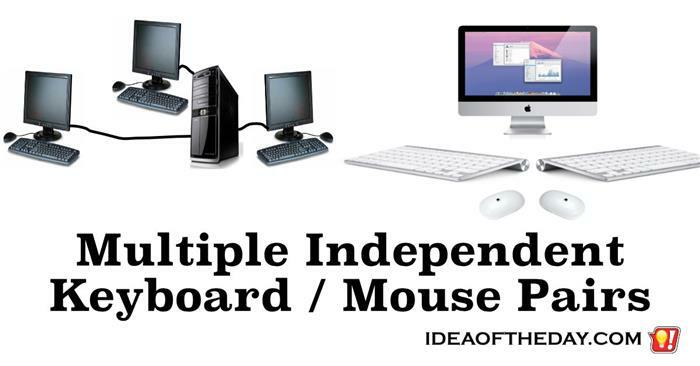 Multiple Independent Keyboard / Mouse Pairs. Collaborate In Real-Time On The Same Computer. Wouldn't it be great if two or more people could use the same computer... at the same time? In spite of their massive computing power, Macs and Windows PCs both have one odd limitation. They were designed from the ground up for one person to use at a time. If Windows and Mac OS X had support for multiple keyboard and mouse pairs, each pair of keyboards and mice would be able to independently launch applications giving them the ability to truly collaborate together in ways that have never been imagined before... On the same computer... even the same monitor... at the same time.